An outstanding real 21 days aged fillet. “And what so special about that, Mr. Almazan?” – you will ask. The key effect of dry aging is the concentration and saturation of the natural flavor, as well as the tenderization of the meat texture. This dish also includes marvelous, very unusual sauce made with the help of Mother Nature resources – snow sauce with white chocolate and cream! You certainly don’t want to miss this video and recipe! 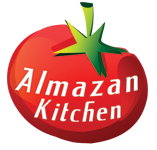 AlmazanKitchen Land of ASMR & Foodporn opens its gates for you! Slice 1kg of 21 days aged fillet into medallions. Salt & pepper from both sides. Wrap the medallions with the bacon and fix it with toothpicks. Preheat the grill, grease it with oil. Grill the medallions until doneness you want, do not forget to flip! Preheat the pan, melt 2 tbsp. of butter. Add 1 hand of flour, 1 hand of organic snow and 1 cup of cream. Mix everything well. Slow cook for a while. Toss in 100g of white chocolate and let it melt. Mix well after! Slow cook until rich saucy consistency. Slice red onion and handful of cherry tomatoes into rounds. Slice green chili into rings. Pour the Snow Sauce onto the serving surface. Place the medallions on the Snow Sauce. Decorate the dish with veggies from the step #1 and #2.